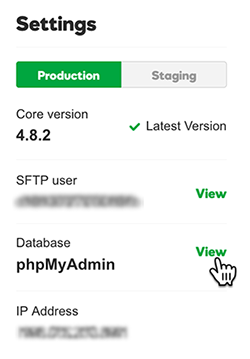 You can open phpMyAdmin to directly edit the database for any Managed WordPress site. This is useful if you want to do a manual import/export of a database, or change individual database values. 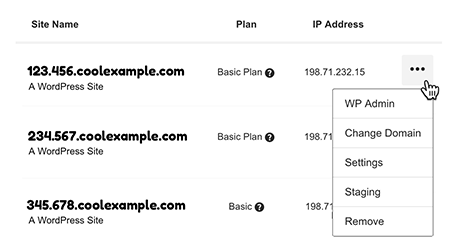 For the website whose database you want to view, click the the three-dot icon in the upper-right corner and select Settings. Under Settings, next to phpMyAdmin, click View. 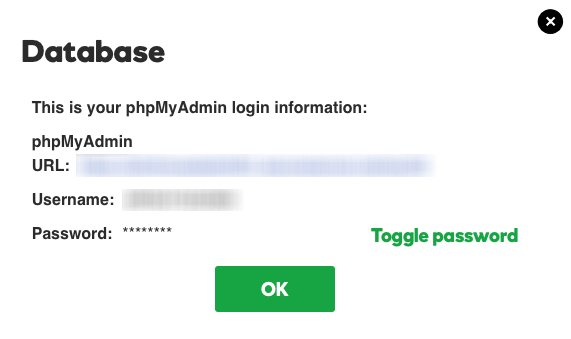 For Pro Managed WordPress accounts (available in U.S.A. and Canada only), we've already logged you in and you'll go right into the database. For Basic, Deluxe, Ultimate, and Developer accounts, continue with the next step. Copy the URL, username, and password to a text file. You need to click Toggle Password to display the password. Open a new browser tab, paste the URL into the address field, and press Enter to go to the database login screen. Paste the username and password into the login screen to access the database.